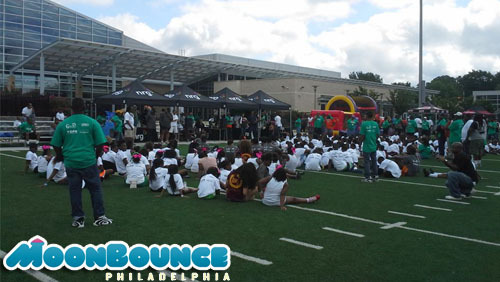 MoonBouncePhiladelphia.com wants to thank The GridIron Classic for allowing us to be a part of such a successful venture in both Philadelphia and Washington D.C. In just a few years this has grown from a one city event to a four city event with no signs of slowing down. The camp features a highschool combine, youth football camp, cheer camp, health fair and a celebrity flag football game. Started in 2010, in an effort to make a unique impact within the youth of Houston, Alphonso Roundtree, a former Miami Dolphin player, developed the GridIron Classic Weekend (GIC) to address a serious void in educating our youth about the importance of health, nutrition and life skills. The GIC is a fun-filled weekend of exhilarating events and activities infused with pro-football players, celebrities, community partners and leaders, who donate their time to motivate young people to be physically active, educate them on how to maintain good nutrition and encourage them to establish positive life skills. In 2013, we will more than triple our efforts and are excited to expand to three additional markets. Gridiron Classic 2013 (GIC) will unveil in Houston, Washington, DC, Chicago and Philadelphia. The GIC team is harder at work than ever, working to forge partnerships that allow us to continue our upward growth. We work with our sponsors to create meaningful partnerships that impact our communities, and with that, we are proud to share that we will serve more than 2,500 children this summer with Gridiron Classic 2013. However, there are still thousands of young people that we would like to reach, and so many more in need of the positive experience that Gridiron Classic provides. We are aiming to reach 10,000 children by the end of 2015.